Tired of that old and drafty Shellfish watch house? Tired of running off poachers from an old and dilapidated dock? SALT GROVE POINT on Cherrystone creek at Eyrehall Creek. A spectacular deep water peninsula with an island like marina and home site, for use as yacht haven, premiere aquaculture and shellfish landing, or extraordinary recreational marine compound. 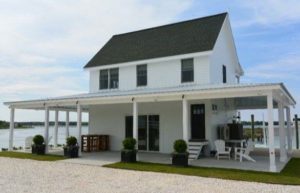 Follow the causeway past the home site out to the point which includes a custom crafted historic restoration of traditional building with shellfish packing room and beautiful upstairs oyster watch house with full bath overlooking multiple boat slips, and a deep water wharf suitable for a yacht basin. Includes an on site boat launch ramp, a 40’x60’concrete pad for a water dependent/use building, an 18’x30′ foundation for other water dependent structure/building, landscaped clamshell parking lot, small one room office building. You may ask yourself, the County has a zoning code that states an “Oyster Watchouse” is not designed to be a dwelling. 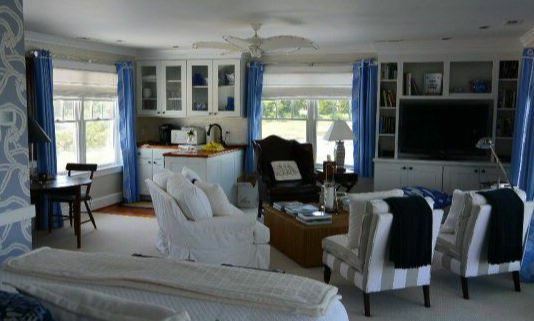 “Dwelling units contain independent living facilities, and generally contain permanent provisions for living, sleeping, eating, cooking, and sanitation.” This “Oyster Watchouse” is not supposed to have a bedroom, kitchen or full bathroom. Also, the “shucking house/grading room” downstairs is being used as a dining room. The ground level floor even has a half bathroom. Will the zoning code of the County be upheld? Will this apply to the current owner and future owners? If you are worried about zoning, or even breaking the law by violating the Chesapeake Bay Preservation Act, have no worries, the Northampton Board of Supervisors has your back. They are on the verge passing a new ordinance that will allow you live in your new watch house, while at the same time by-passing the CBPA. This can all be yours for only $795,000. Bayshores as well as seashores will soon be out of reach to ordinary citizens as well as traditional watermen, and that will be a sad day! I wish the Eastern Shore had been out of reach to Come-Heres for the last 75 years. Then you would still be driving on dirt roads and highways with a horse and buggy! Come-Heres, as you say, are the ones who buy your seafood, crops and put money in your pocket! Its people like you who give you From Heres a “Oh I’m better than you so please leave”! Leaving Ain’t happening Blue Hoss! If you have something to sell, like a boat, a house, a car, ect, and a person drives up with foreign plates on their car….the price just doubled. This is an easy way to start. You mean like home values doubled, and then doubled again, giving people who never had squat a lovely equity position? Dang them furriners!!! They took our squalor!!!!!! From what I see of modern society, dirt roads and horse and buggies sound great.